NOW BerryDophilus provides 2 billion CFU from a combination of 10 clinically validated probiotic bacterial strains designed to support gastrointestinal health and healthy immune system function. * Healthy intestinal flora also helps to create a favorable environment for the absorption of nutrients. 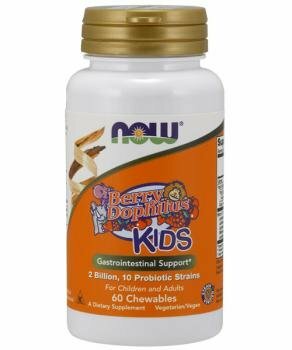 * BerryDophilus can be used by both adults and children. Sweetened with xylitol, BerryDophilus won't harm teeth and it tastes great. Suggested Use As a dietary supplement For children (age 2 & up) and adults Chew 1 tablet 1 to 3 times daily between meals or on an empty stomach. For children under 2, use only on the advice of a healthcare practitioner. KEEP LID TIGHTLY SEALED. KEEP REFRIGERATED TO MAINTAIN POTENCY. - Or as directed by your healthcare professional. Does Not Contain: Not manufactured with wheat, gluten, soy, milk, egg, fish, shellfish or tree nut ingredients. Produced in a GMP facility that processes other ingredients containing these allergens.